The Kim Leather Set of 2 Bar Stools offers a stylish and practical seating choice, with timeless leather upholstery. Brosa uses 100% pure high quality leather, which has been treated for long lasting quality. Due to the fact leather is a premium natural product, each piece has its own unique markings. The seat of the Kim has been curved for comfort, making it ideal for extended seating. The sloped seat is as stylish as it is functional, paying tribute to popular Scandinavian design. See also the Kim Set of 2 Bar Stools in fabric. The frame of the Kim has been carved from polished solid ash wood, and features a conveniently placed foot rest for added comfort. Discover the complete range of bar stools available from Brosa. Take your pick from a range of lush leather shades, in light and dark hues from brown to black. Add luxury to your home with these gorgeous bar stools and leather that grows softer with extended use. See, touch and feel our fabrics used on our Kim Leather Set of 2 Bar Stools. For Free! Simply select up to 3 fabrics and add them to your cart. Delivery is on us. Good news! 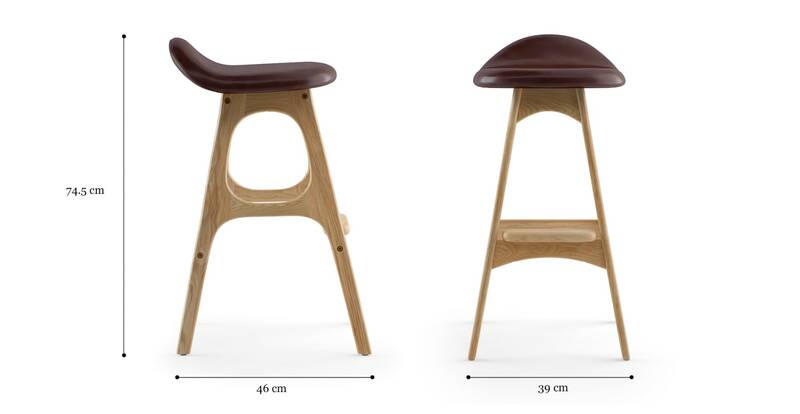 Kim Leather Set of 2 Bar Stools is currently on display in our Alexandria Collingwood studio.